* Note: All the 3 Board Monte Sets come without handling instructions at this time. These sets are for the ones that already know the standard handling of the 3 Disk Monte. or the 3 card Monte. Which is done similar with some adjustments for the extra thickness of the boards from using cards. 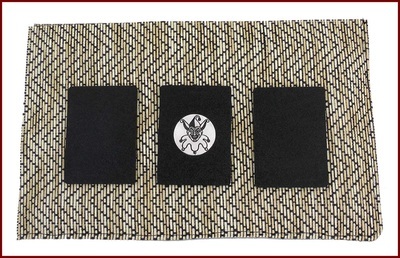 The new 3 Board Monte sets are for the ones that prefer the playing card shape. They are the same size as a playing card, like used for the 3 Card Monte game. The difference from the playing card; is they are plastic boards and are 1/4" thick. The thicker boards brings more weight where they will never blow off the surface if played out doors. Like all the disk and board sets, they are professional quality made sets that should last you a life time with proper use. Scratch Resistant finish on both sides. Having both sides with the matching Scratch Resistant finish not only will it protect your set, it brings many features to go beyond the standard disk Monte game. Like doing false turn overs or using two money boards where only one is ever seen. You have many options for the embedded insert you want for your set. 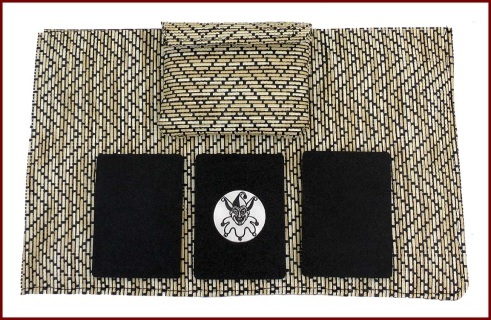 All of the Disk Monte inserts can be embedded into the Monte Board sets. Just make note with your order on which insert you prefer for your set. The Pro set has it all. The 3 board Joker Monte set comes with a custom case and the board throw mat. 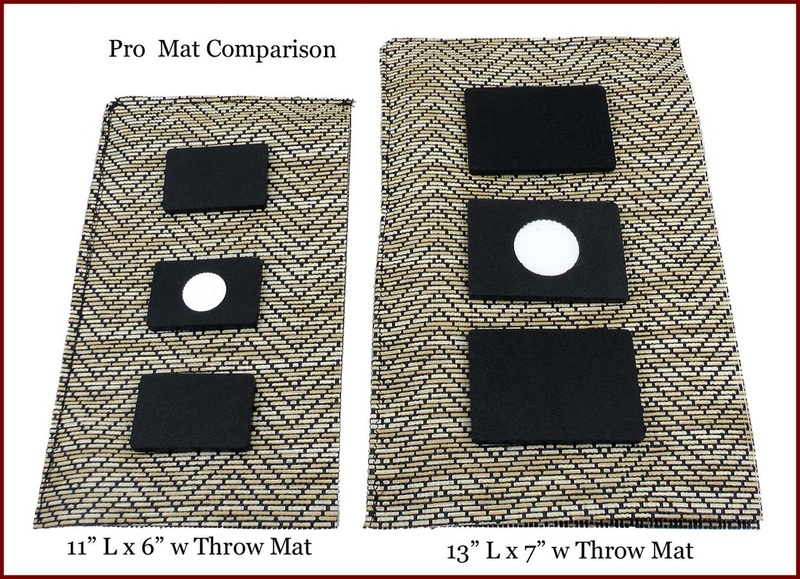 The throw mat is made with a slide resistant fabric and used with newspaper inside to give the perfect throwing surface. You can not find a better combination! 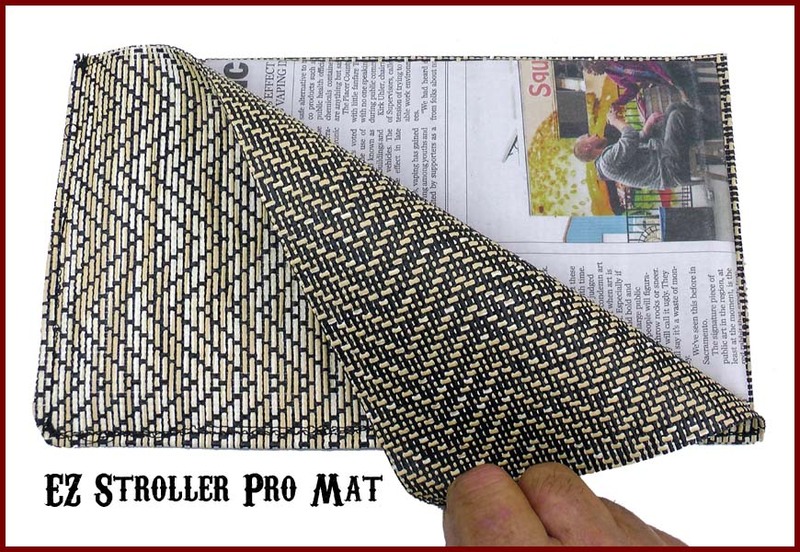 * Fully adjustable surface on how you throw or what sound you want, by how much added newspaper inside. * Much cleaner, by not having any contact with the newspaper ink. * Rolls up to carry with ease. 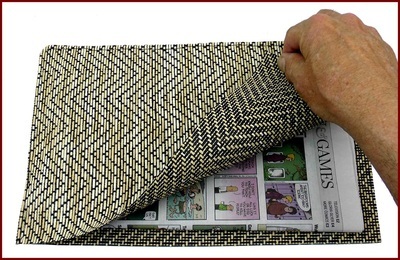 * Takes a standard double folded newspaper 11" x 5 1/2" that fits inside. Throwing surface 13" x 7". * The disks standout with a better natural dimensional surface than newspaper by it's self. * Sewn with heavy duty thread. Same matching strong material as the throw mat. 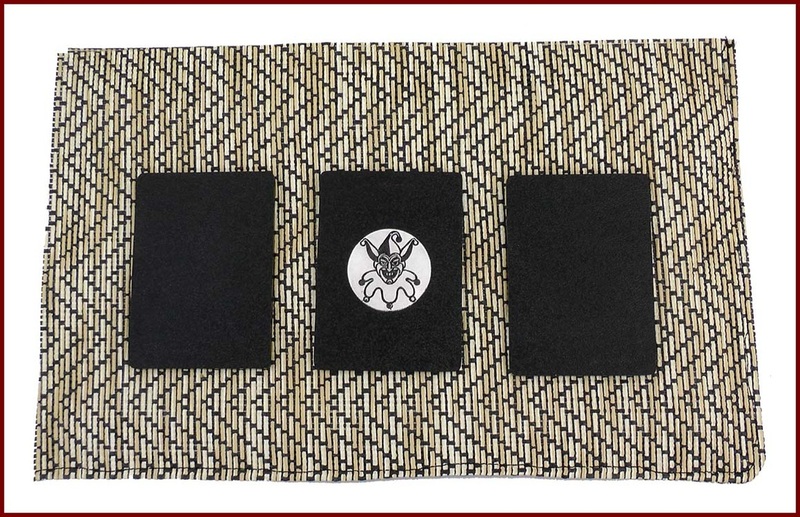 All sewn with heavy duty thread and sewn on Velcro closure. Easy to carry. 4" W x 3" H x 3/4" T. Fits in any pocket. The Pro set has it all. The 3 board Monte Joker Pro set comes with a custom case and the board throw mat. The Pro set has it all. 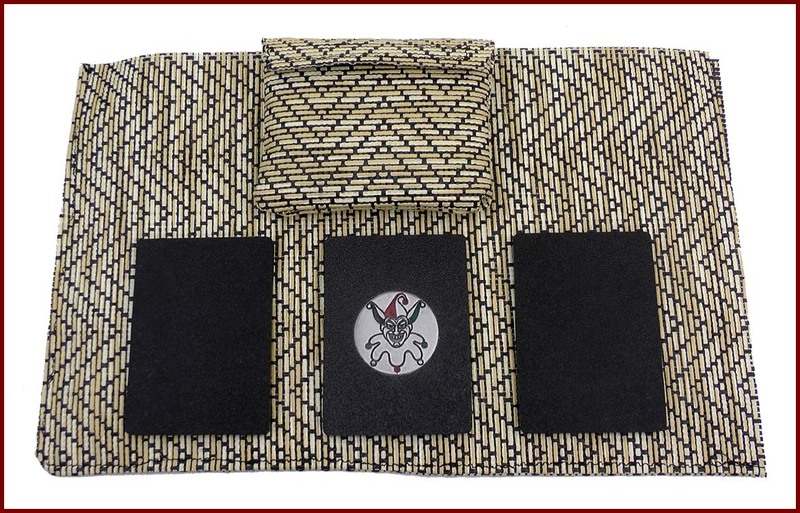 The 3 board White Chip Monte set comes with a custom case and the board throw mat. 1 set of 3 Monte Plastic boards - Plastic Insert to be noted in checkout or send email from contact page! The Pro set has it all. 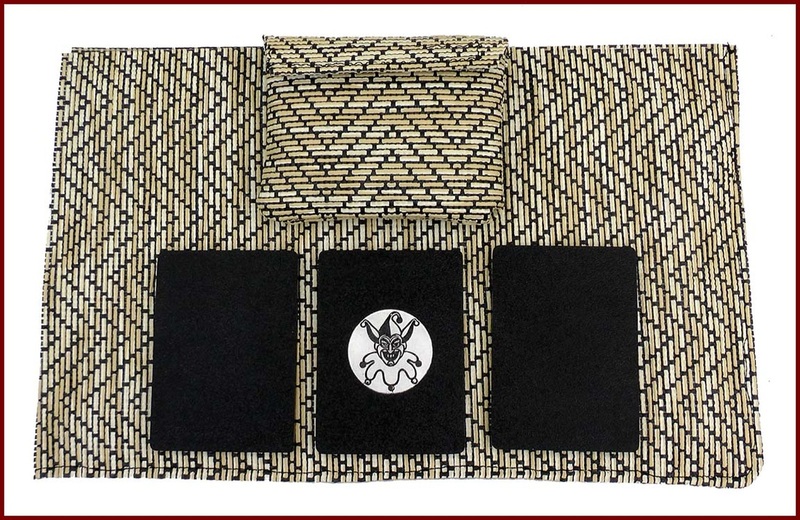 The 3 board Peek Show Monte set comes with a custom case and the board throw mat. 1 set of 3 Monte Plastic boards - Cold Cast Metal Insert to be noted in checkout or email from contact page! 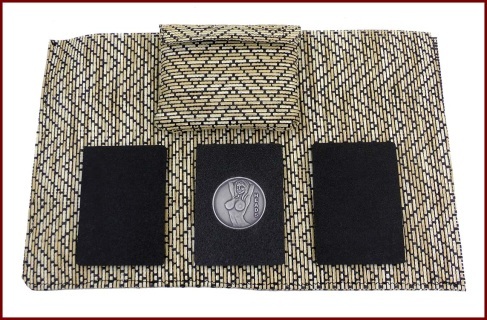 The new 3 Board Monte - EZ Stroll sets are for the ones that prefer the playing card shape. They are the same size as a miniature playing card. The difference from the miniature playing card; is they are plastic boards and are 1/4" thick. This is NOT a novelty set. The size and weight bring a board that is very easy to throw. This type Monte set has become my personal favorite for many reasons. 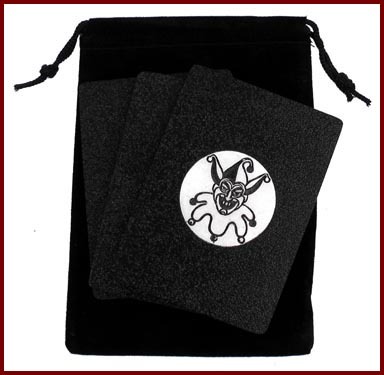 You can do much more sleights and they are easy to carry with you. The 3 boards fit in a small draw string bag that has a stainless steel cable with a screw together connector. This cable is attached to a belt loop on your pants. When you want to get the set, you just open the draw string bag and take them out. 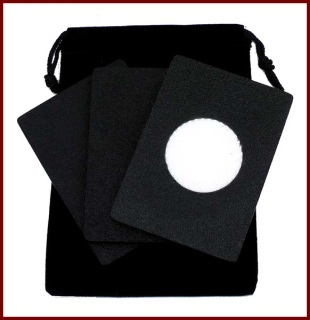 If you have the pro set, you can even carry the throw board mat in your back pocket. 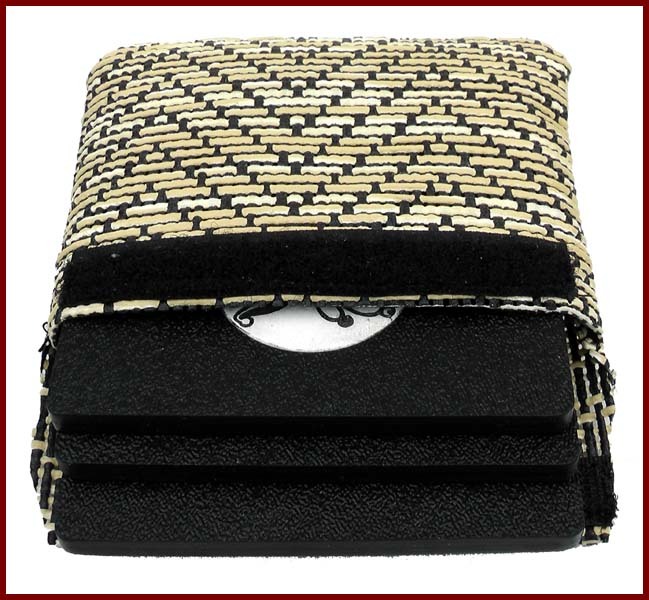 The throw mat can be folded in thirds to fit nice. 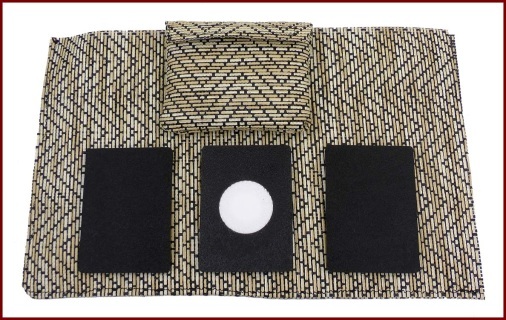 This set does not have the mat. The thicker plastic boards brings more weight over cards,where they will never blow off the surface if played out doors. Like all the disk and board sets, they are professional quality made sets that should last you a life time with proper use. Having both sides with the matching Scratch Resistant finish not only will it protect your set, it brings many features to go beyond the standard Monte game. Like doing false turn overs or using two money boards where only one is ever seen. This set has a Real Lincoln Dollar Coin embedded insert. Again is my personal favorite. 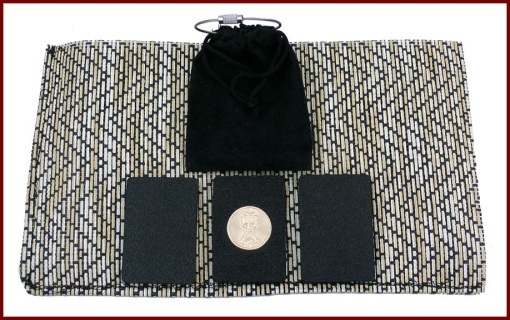 The coin is a uncirculated Golden 1" diameter coin that stands out very well. 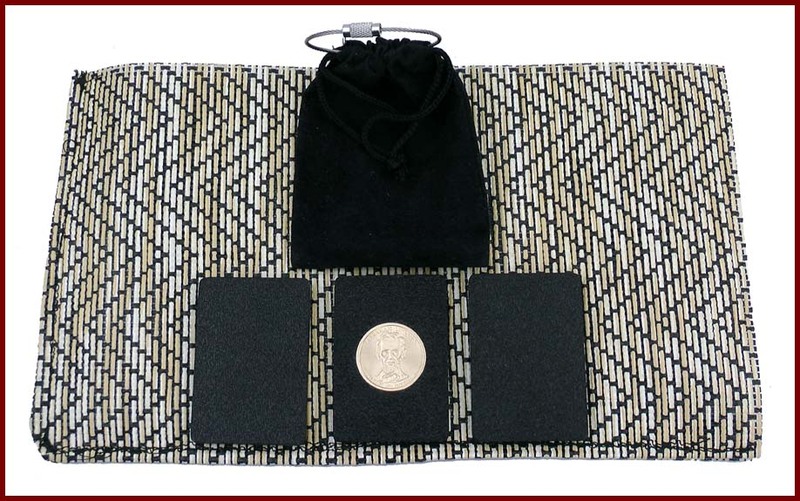 Also with the weight of the coin, you will always know which board is the money board when shuffling them. The new 3 Board Monte - EZ Pro Stroll sets are for the ones that prefer the playing card shape. They are the same size as a miniature playing card. The difference from the miniature playing card; is they are plastic boards and are 1/4" thick. When you want to get the set, you just open the draw string bag and take them out. 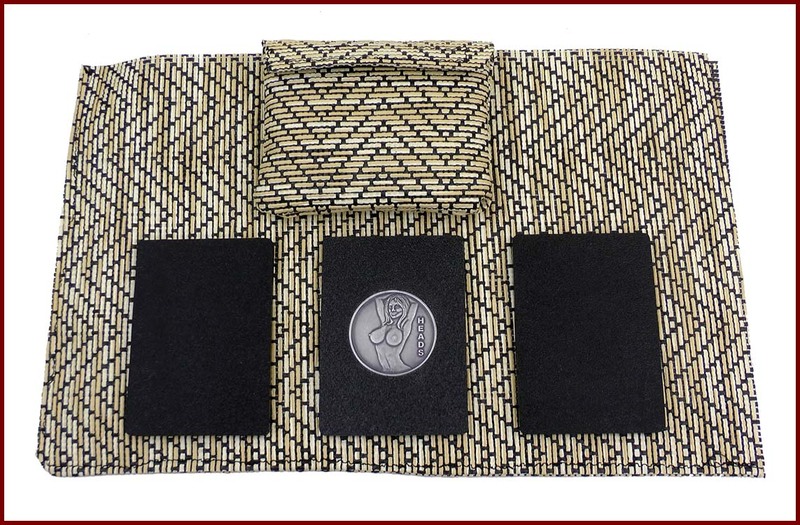 This pro set with the throw mat that you can even carry in your back pocket. 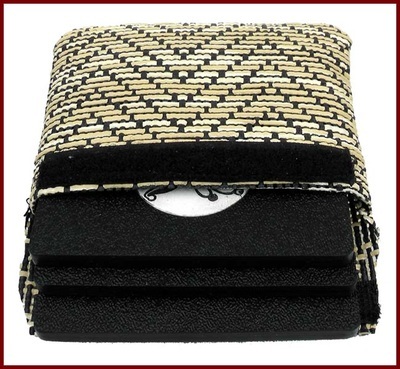 The throw mat can be folded in thirds to fit nice. The Pro set has it all. 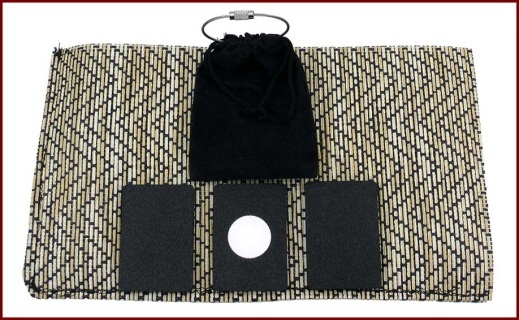 The 3 board set comes with a added stainless steel cable draw string bag to attach to the belt loop and the board throw mat. 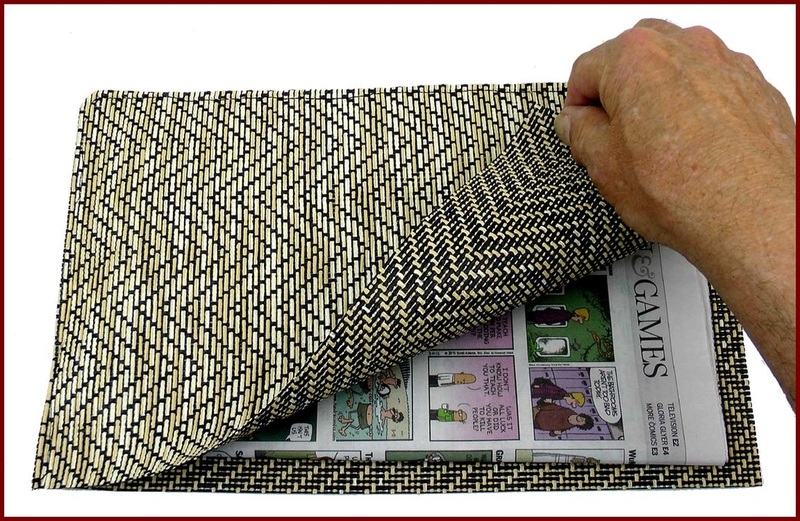 * Takes a standard double folded newspaper 11" x 5 1/2" that fits inside. Throwing surface 11" x 6". 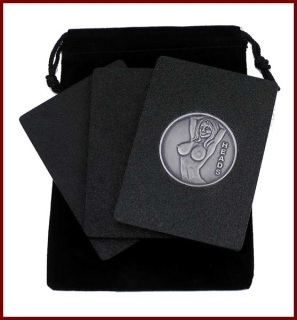 The insert being a real uncirculated Abraham Lincoln Presidential $1 Coin will make them harder to get in the future, so you might want to get this set while they are available.! You have many options for the embedded insert you want for your set. 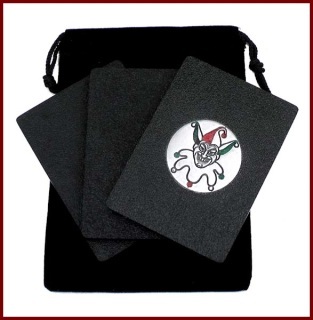 All of the 2" Disk Monte inserts can be embedded into the EZ- Stroll Monte Board sets. Just make note with your order on which insert you prefer for your set. This set has a white Plastic embedded insert.